Director J.J. Abrams had an unenviable task when making the first new Star Wars film for a decade. He needed to find the perfect balance between new and old. The film needed to be enough like the original trilogy to feel like a Star Wars movie, to spark recognition in the fans, but it also needed to introduce new characters and new stories. It needed to bridge a generation gap, introducing a revitalized Star Wars for a new audience. It also needed to repair the damage done by a underwhelming prequel trilogy. It seemed impossible that one film could live up to these expectations. The atmosphere at the midnight screening was incredible – the crowd were so emotionally invested in what they were about to experience. It’s moments like these that you can truly understand how Star Wars has transcended cinema to become a pop culture phenomenon that has defined generations of filmmakers and audiences. We were excited, we were anxious. We were hopeful, but we were afraid of being disappointed. Star Wars is our culture’s mythology – it is sacred, yet all so vulnerable. The lights went down. And then I forgot about all of my worries and was taken back to a Galaxy Far, Far Away. Yes, it seems too good to be true, but we finally have another brilliant Star Wars film. Major spoilers below! Don’t keep reading past this point if you don’t want to spoil the film. 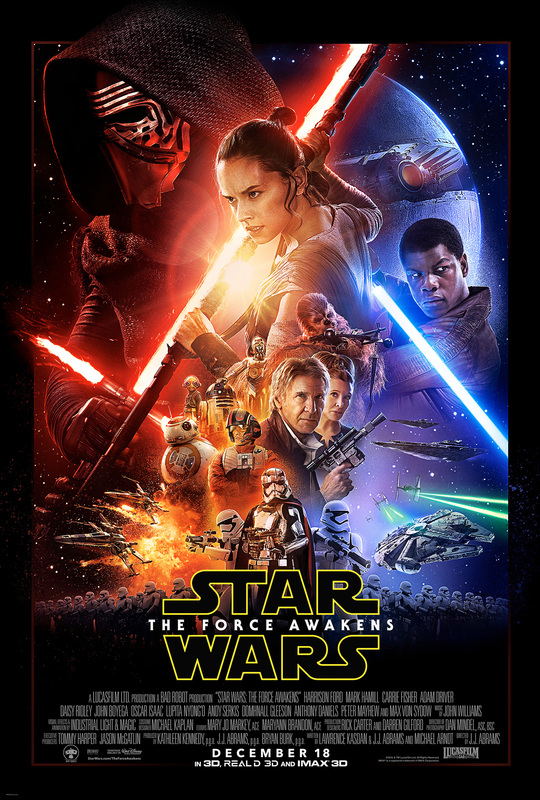 The Force Awakens exceeded my expectations in almost every possible way. It benefits from great acting, memorable characters, gripping action sequences, a light dusting of nostalgia, and a sense of tragedy that has stayed with me for the past week. I’m not even ashamed to admit this – I saw the film four times on the opening weekend, and each viewing added a new dimension to the experience. I was so overwhelmed by the first screening that I couldn’t even absorb everything I’d just seen. I was just sitting there, trying to piece together what I was watching, and in stunned awe of what Abrams was doing with our beloved universe. I couldn’t believe I was watching a new Star Wars film. And it was good. Really, really good. It was only on subsequent viewings that I was able to pinpoint exactly why this experience had lived up to the cultural mythology that is Star Wars. I wrote last week that one of J.J. Abrams’s strengths is capturing the aesthetics of other filmmakers. And he has excelled in this aspect in The Force Awakens. The film feels like a Star Wars movie. It has the “lived in” universe feel of the original trilogy. It has a basic good guys vs bad guys plot. It has excellent pacing. It even has those lame wipes between scenes that became a trademark of George Lucas’s films, but it’s all part of the Star Wars experience. Impressively, Abrams has managed to find that balance between old and new. For all of the borrowed aesthetics, he manages to launch a new generation of the saga. We have new characters, a new backdrop, and new mysteries to ponder. He has put a distinctive stamp on an old franchise. The film is helped by some excellent acting. Harrison Ford returns to the role of Han Solo with ease, giving one of his most energetic and charismatic performances in the last decade. Daisy Ridley and John Boyega are instantly likeable as Rey and Finn. Ridley, in particular, stands out as a strong female lead for a new generation of fans. I’ve been following Oscar Isaac’s career since Sucker Punch (yes, really), and I loved his portrayal of X-Wing ace Poe Dameron. His scenes with droid BB-8 are some of the warmest moments between humans and droids in the entire saga. And who can blame him? BB-8 was adorable. Even Chewbacca feels like a real character in this film – a partner, rather than a side-kick. His banter with Han has such great comic timing that the audience can understand his roars and bellows without the need of a translator. Adam Driver’s performance as Kylo Ren was one of the unexpected highlights of the film. He begins the movie as a real villain, with his imposing mask a deliberate homage to Darth Vader. But as the story progresses, we discover that he is a conflicted and confused young man. He aspires to be as powerful as Vader, but his residual loyalty to his family means that he just doesn’t have Vader’s killer instinct. When he finally removes his mask, there is fear in his eyes. His training isn’t complete; when he can’t extract the map from Rey’s memory, he beseeches Snoke to help him. He is prone to tantrums and makes mistakes. Whereas Vader was an authoritarian bad-arse, Kylo Ren is being manipulated by the forces of darkness. Adam Driver is able to play this role without falling into the kind of whiny petulance that mired Hayden Christensen’s performance in the prequels. 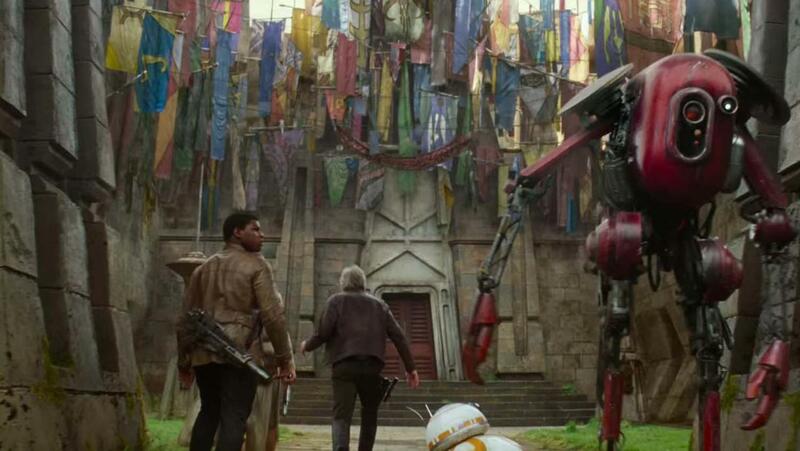 It also feels like a proper Star Wars film in the way that it gives us a tiny glimpse into a much larger universe. There’s a lot of backstory to this film. The galaxy feels like a living, breathing place, and Abrams doesn’t need to explain all of the details in order for the plot to work: he knows that the audience can extrapolate on those little hints. Han Solo’s adventures between Return of the Jedi and now are bound to be explored in detail by a legion of writers and artists. Every one of those aliens in Maz’s temple will be given his/her/its own backstory, in the same way that the patrons of the Mos Eisley cantina became famous. The relationship between the New Republic and the Resistance will be fleshed out properly. Cleverly, Abrams has left that political dimension to other writers, rather than making it the focus of the film. He knows that Star Wars should be about adventures, not politics. 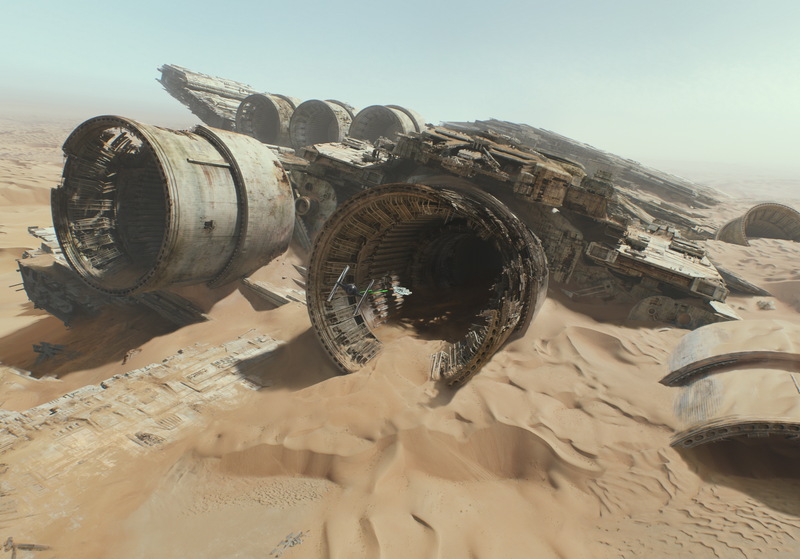 The wreckage of starships strewn across the surface of Jakku hint at an enormous battle in the past. Here, the Falcon is pursued through the engines of the Super Star Destroyer Ravager. However, I do have some criticisms of the film. One of my worries was that it would simply be a retelling of A New Hope, and this turned out to be accurate. The plot similarities are almost too long to list: vital information is hidden in a droid on a desert planet, a force-sensitive protagonist finds this droid, escapes on the Falcon, encounters a resistance movement and a superweapon, mourns the death of a mentor, and finishes the movie with a climactic X-Wing attack on the weapon’s sole weak point. (And poor Leia is in the same situation as she is in A New Hope – huddled in the rebel base as a superweapon is aimed at the planet.) Despite the overwhelming similarities, though, the character arcs in this movie are completely different from anything we’ve previously seen in Star Wars. Rey is searching for belonging, but it seems as though she’s searching for something in her future, rather than in her past. 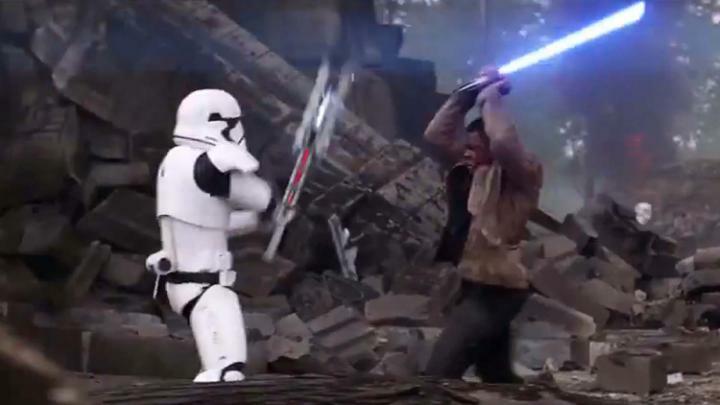 Finn is a stormtrooper who has betrayed the First Order. Han and Leia try to save their son from the dark side, in what seems like a tragic metaphor of parents losing a child to drug addiction. And it’s these motifs that are the heart of the film, allowing me to somewhat overlook the similarities to A New Hope. Some elements of the plot felt a little weak. In A New Hope and Return of the Jedi, the Death Stars were the main threat to the survival of the Rebellion. 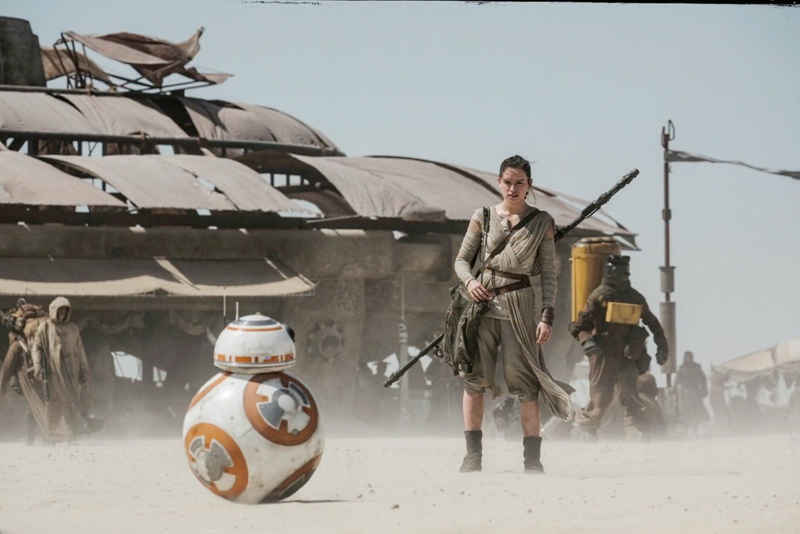 In The Force Awakens, Starkiller Base feels almost incidental to the main quest of finding Luke Skywalker. It lacks weight. Perhaps this is because the Resistance only became aware of Starkiller Base halfway through the film, but I think more emphasis needed to be placed on its destructive potential. The battle to destroy it took a back seat to the other plotlines. Similarly, Finn’s character arc needed a bit more development. He spends the first half of the film wanting to flee from the First Order, and only changes his mind when Rey is captured. Not enough emphasis was placed on this critical moment, the moment he chose to stay and fight. Disappointingly, John Williams’s soundtrack is a little lacklustre – probably the weakest of all seven Star Wars films. Even the prequels had great soundtracks. The Force Awakens was lacking a really distinctive piece of music, something like “Duel of the Fates” or “Imperial March” that would become part of pop culture lore for future generations. “Rey’s Theme” is the best track of the film, and its use as a leitmotif for Rey is not only perfect for her character, but will undoubtedly become one of the most recognizable musical parts of the new trilogy. I also enjoyed “The Jedi Steps and Finale,” which plays as Rey ascends the stairs towards Luke at the end. But, overall, the most memorable musical moments from The Force Awakens come from the brief, familiar refrains of the beloved classics of the saga. However, it is easy to forgive these criticisms because the rest of the film is so strong. And whereas these criticisms seemed quite important after my first viewing of the film, they became less important on subsequent viewings. I could watch the film and enjoy it for its strengths. Part of its strength is in its emotional impact, especially for fans of the franchise. I came out of the cinema with a heavy heart. It’s an emotionally draining experience. Part of my sorrow was not simply at the events in the film, but the loss of the “happily ever after” future that was implied at the end of Return of the Jedi. With the Emperor dead and the Ewoks dancing around their campfires, it was easy to assume that the worst was over for the main characters. Indeed, in the old Expanded Universe novels, the characters have occasional losses in their protracted war of attrition against the remnants of the Empire, but they themselves remain relatively unscathed. Han and Leia have a loving marriage, and Luke is able to restart the Jedi Order. This was the kind of future I’d expected Abrams to mimic. Yet The Force Awakens destroys Luke’s nascent Jedi Order and turns Han and Leia’s life into a tragedy – a bold choice, one that sets the tone for the new trilogy. Han and Leia’s tragedy is the focus of this film – I’m hoping the tragedy of Luke’s life will come in later films. Abrams has proven himself devastatingly effective at destroying happy endings. In the original trilogy, Han develops from a smuggler who is one step ahead of the bounty hunters to a respected general in the Rebel Alliance. He finds redemption through the love of his friends. As he grows, Leia softens towards him and finally stops denying her attraction. That’s what makes The Force Awakens so tragic – Han’s chance at a good life is mired by war and loss. He has lost his son to the dark side and his marriage has fallen apart as a result. The happy ending that was implied at the end of Jedi never came to fruition. Instead, Han and Leia must stick to playing the same roles – smuggler and Rebel leader – that they have always known, and any happiness together is denied to them. I will be very interested to see Leia’s story in future films: how she manages to overcome such tragedy will undoubtedly add new dimensions to her character. After years of waiting, it’s so good to be able to sit down this Christmas Eve and write a review of a good Star Wars film. It feels like a vindication. The most exciting thing about The Force Awakens is that it establishes a great precedent for a new trilogy and for a new generation of Star Wars fans. We’ve got new mysteries to ponder and a new universe to explore. Thank you, J.J. Abrams. Thank you, Disney. The franchise is in good hands.